I Have a Crush on You…But What Does that Mean? As Katie snuggled in bed with her favorite blanket, her first loose tooth still wiggling, it was the moment of hushed and giggly confessions as I tucked her in and kissed her good night. A little shy around the eyes, a little sly of smile, she told me the name of her first official crush. He’s a sweet little boy, I must say. Oh sure, she’s had a “husband list”—infamous in our house—since the age of four. Most of the denizens of this list have been literary characters with a couple of exceptions: Hagrid, Sirius Black, Captain Jack Sparrow, Thor, Steven Tyler, and several more. Her plan? They would all live with us someday…in the shed outside, of course. This boy, though, is part of her real life. I remember my first grade crush: Ethan R. One day he even called me when I was playing after school in my backyard on my swing set. To say we were a precocious bunch of first graders that year of 1985 would be putting it mildly. Every recess was a chase game. The school had a rule that boys could not go into the girls’ restroom (and vice versa), so when it was our turn to be chased all the girls ran into our restroom. As the chasers, however, we ladies served no mercy. Those boys, including Ethan, ran for their lives all over the schoolyard (where were the teachers?? ), until we pinned them to the fence or down on the ground and kissed them as they screamed. Why did those boys never flee to their bathroom? That’s what I’d like to know… Oh who am I kidding? I’m married now: I know very well! Ethan was the first—no, Mr. Rogers and Isaac from Love Boat were the first—of many crushes in my life. Somewhere in there was a crush that made a friendship stronger over time, a crush that wrecked a friendship irreparably, and a crush that became my first intense 17-year-old love, a love perfumed with summer jasmine at three in the morning, the we’re-leaving-for-separate-colleges love, the one that became the practice and instruction for all the hard goodbyes I would ever face again in this life. There was the 6th grade crush who often passed by my street, and I would keep vigil reading in a chair in my room waiting for him to pass, listening (naturally) to Paula Abdul’s “Rush Rush” on repeat (hello, 1990s). He had several journals dedicated to his existence. Now that I sound like a scary loser, I will say that I eventually moved on and set my sights on the boy who would become my first puppy love kiss (no, those first grade boys don’t count since they were screaming) one day after school. After we broke up a few weeks later (young puppy love is short, man), he kissed other girls and I rotated through a handful of boys I liked from afar. Then I met Mr. Rochester, my first literary crush. Darcy? Yeah, okay. Heathcliff? In my more conflicted moments. Even to this day when I read Mr. Rochester’s words to Jane, my stomach flutters. I think I’ve always loved that gloriously painful feeling of unrequited love, and the excitement of seeing the object of passion. The most cathartic poetry comes from it. For some reason the paintings of John William Waterhouse come to mind, the ones with the longing maidens staring wistfully off into space on a grey day. I am sure I have modeled those expressions more than once. Such delicious torture of wanting all of someone, or something, but being unable to have him/her/it enlivens the mind. To have a crush is to live in a story. A crush is, after all, a work of superior fiction, a fantasy life that exists in liminal space. To have a crush is to bring the literary imagination almost-but-not-quite into real life. It is to live constantly at the threshold of what we know to be true and what we have yet to know. To have a crush is to have curiosity, passion, and yes, obsession coexist for lengthy periods of time solely in the mind and unaided by anything except one’s internal fictional narrative. To sustain a crush, our mind has to occupy a space in which anything is possible. It is an open, artistic, and creative mental space. The pleasure in the torment, the awe at the object of affection: these are perhaps the hallmarks of a life lived according to Burke’s definition of the Sublime. It is the same sublime feeling of shock and wonder we feel as we look over a precipice at a craggy vista or feel the thrill of the death drop on Tower of Terror: we know we will not perish, and thus the excitement titillates us from head to toe. Perhaps that “crush” mindset is essential to our grasping of the universe? Or at least, our quest to grasp it. When we have a “crush” on knowledge, we do more than merely seek it. To live a life full of passion is to wake up daily and have a crush on something, sometimes many things. If we want to know a subject deeply, don’t we need an obsessive curiosity? If we want to create, musn’t we exist in that liminal space of real and imagined and bring one realm into the other? I wholeheartedly love my husband, yet I also approach him with the crush mindset, which differs from love and which I believe we can will into being for ourselves (or squash if it does not serve us well). How powerful would we be if we could apply that crush mindset to other parts of our lives, besides people? I have a crush on running. I have a crush on Hamlet. I have a crush on autumn. I have a crush on playing with my kiddos. I have a crush on physics. I have a crush on this day. As I was thinking about this topic, my first thoughts were, “I don’t think anyone has ever had a crush on me.” Then I wondered if there has ever been a person who did have a crush on me, and I was just oblivious. I wondered if I ever had a crush on someone when he did not know. I did have a crush on someone in 10th and 11th grade, and I thought I was playing it off really cool (in fact, I was playing it so cool I even convinced myself it wasn’t a crush but just admiration…although my journals reveal otherwise to my laughing adult eyes now). Ah, the schoolyard. Why does talking about our crushes make us sound insane? I mean, seriously. Anyway, in the process of going through a cabinet I found a little box I had made in elementary school. Inside this box was definitive proof that, yes, at some point in my life I was the object of a crush. 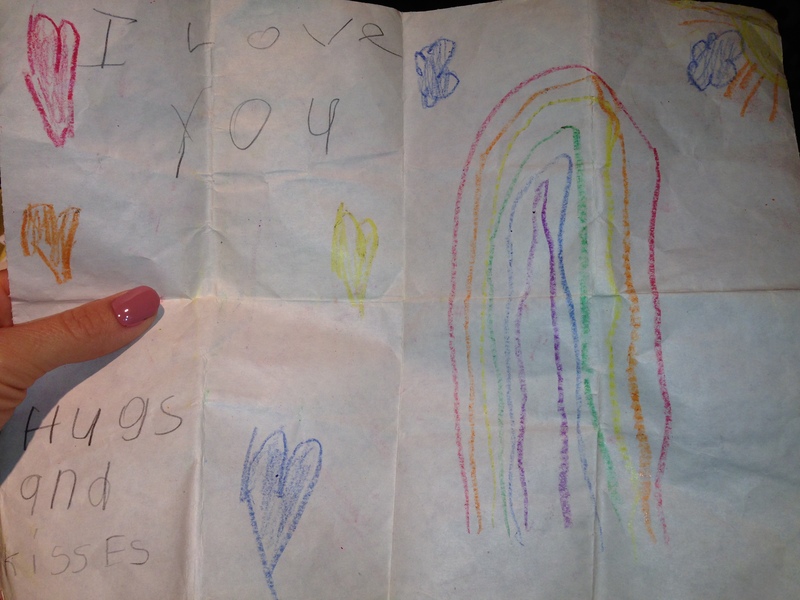 These were from D, at a mixed age daycare. I remember he was a year or two older than I was. I love the rainbows and sunshine—if it is to be anything, love should be rainbows and sunshine and hearts, right? 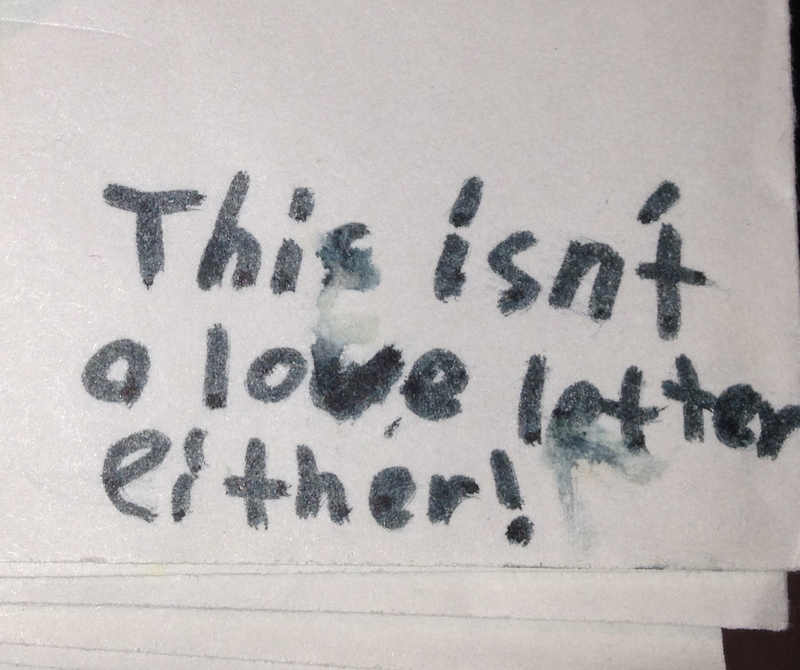 For the boys who have become the men who wonder if we girls kept these notes…some of us do. Some of us have never laughed at you for the love you gave out. This note was from T.R. in 4th grade. We had the same teacher, and I had a crush on him, too. He was a sweet boy whose birthday fell on Valentine’s Day. 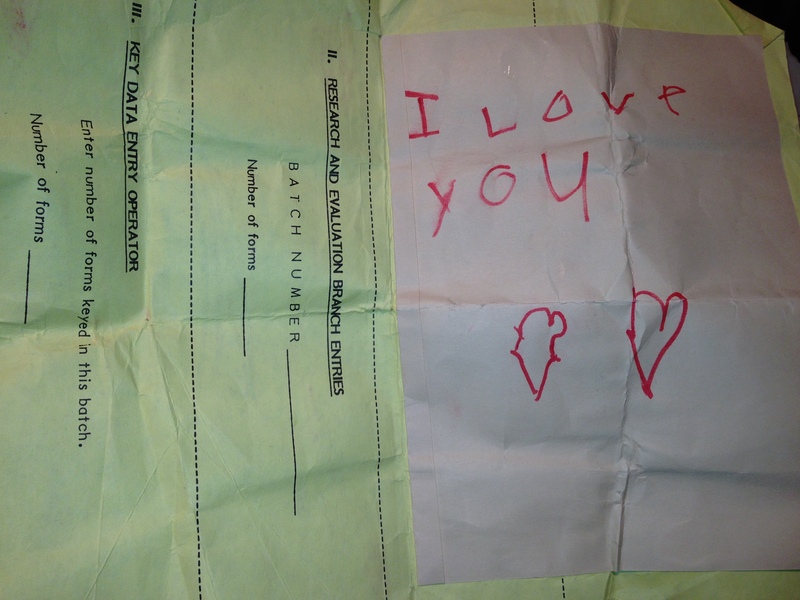 This note says, “Will you be my girlfriend?” He had started to write, “Woud [sic] you be…” and then erased and changed it. He might have sensed my penchant for spelling things correctly and decided to go with a word he knew, or perhaps he had a 4th grader’s instinct that the conditional mood might leave too much up in the air. (Would I be? And if I said yes, starting when)? Guess we weren’t pulling any punches here, eh? This note, one of three from A.E. in middle school, tickles my fancy even more now. At the time I found this approach unworkable. He sent me three letters that weren’t really letters but drawings, each of a piece of punctuation colored in dark black marker. The first was an exclamation point, the second was a colon, and the third was a question mark. Each note was folded and each had a similar disclaimer in the corner. A man that understands my love for grammar and conventions and plays to my sense of irony? But I was crushing on someone else at the time… Even I had to go through my rebel-boy phase, sorry nerd-boys. I know: it’s like the pot calling the kettle black. But I ended up with one of you! Oh Sarah! This was the most fantastic blog. I have had a lot of these ideas about crushes, and i loved how eloquently you wrote about them! I was a major ”crusher” in my teen years. Unrequited love was my favorite diet serum 🙂 when the guys liked me back (occasionally), it was always too much for me. My crushes were my fantasies, and I had supreme control of them! The teenagers in real life were always something of a let down. Give me Rhett Butler or Mr. Rochester any day! Hot stuff! ‘How powerful would we be if we could apply that crush mindset to other things besides people?’ I have often wished that I could have bottled my ‘crush energy’ and turned it into a pill I could take now! But it’s more than that, I wish I could FEEL something that way again, for old times sake. I’m glad to be 33, married, a mama…but there was nothing like those feelings.